Four clinical trials for investigational cancer therapies have shown positive results in combating advanced ovarian, lung, and thyroid cancers, as well as chronic lymphocytic leukemia. The results, which were presented at the 50th Annual Meeting of the American Society of Clinical Oncology (ASCO), have increased researchers’ hope for finding ways to slow down disease progression and improve survival rates. One of the new drugs, developed by Eli Lilly Company, is ramucirumab, which, combined with the traditional docetaxel chemotherapy, was able to prolong the lives of advanced non-small cell lung cancer patients six weeks longer compared to ones who only took chemotherapy. The phase III clinical trial for ramucirumab marks the first time in a decade that an experimental therapy has shown a survival benefit in second-line treatment for non-small cell lung cancer. The drug developed by Lilly’s ImClone unit is a monoclonal antibody that targets a protein called VEGF receptor 2, and blocks the formation of the blood vessels that nourish tumor growth. Despite the seemingly negligible difference in prolonging the life of patients, researchers believe the results are statistically significant and clinically meaningful, since advanced lung cancer typically leads to extremely poor survival projections, after initial treatment. The findings could impact care of 60,000 patients each year in the country. The clinical trial included 1,253 patients, with stage IV NSCLC (26 percent had the squamous subtype), who received either ramucirumab with the common chemotherapy drug docetaxel or just the chemotherapy. The first group lived on average 10.5 months, compared to the second group, which lived 9.1 months. Researchers verified the benefits of the drug were consistent with the presence of squamous or non-squamous forms of the disease, which proposes ramucirumab may be suitable for the major subtypes of non small cell lung cancer. The second new study, RESONATE, which involved researchers from The University of Texas MD Anderson Cancer Center in Houston, revealed a new course of treatment for patients with resistant or relapsed chronic lymphocytic leukemia. The oral agent Ibrutinib is a highly active therapy that has proven to delay disease progression and extend survival. This is the first time an oral drug was demonstrated to provide survival improvements over standard therapy. 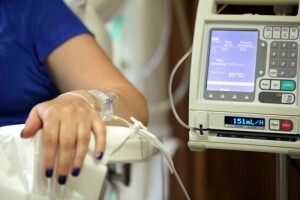 The standard treatment for patients who suffer from the most common form of leukemia in adults is chemo-immunotherapy. However, a large number of patients don’t tolerate the intensive treatment and take the alternative Ofatumumab, but studies reveal it is much less effective. Researchers believe Ibutrinib may be a new option for the common adult disease, especially among older people who are most likely to not tolerate traditional chemotherapy. The study included 391 patients with relapsed or refractory CLL or small lymphocytic lymphoma, and the results showed they progressed after two or more prior therapies. The patients, which had a median age of 67, were randomly administered either atumumab or ibutrinib. In a third clinical trial, Nearly two-thirds of the patients responded positively to Ienvatinib, which delayed thyroid cancer progression by 14.7 months over placebo. Findings from the SELECT phase III study reveal that the new drug is highly effective in patients with radioiodine-resistant (RAI) and advanced differentiated tumors (the most common subtype of thyroid cancer and commonly treated with surgery and radiotherapy). Tumor shrinkage was observed as well among 65% of the 392 patients analyzed. In the fourth clinical trial presented at ASCO, a new targeted combination of two investigational oral drugs has been proved more active to combat recurrent, platinum chemotherapy-sensitive disease or ovarian cancer related to mutations in BRCA genes. The drugs are the PARP inhibitor olaparib and the anti-angiogenesis drug cediranib, which increased the progression-free survival from nine (on patients treated only with olaparib) to 17.7 months. This is the first time these two drugs were combined and could mean an important development in treating ovarian cancer. Both drugs activated each other’s effects and were able to minimize tumors in 80% of the patients. A large number of women with high-grade serious ovarian cancer suffer a relapse after initial chemotherapy, which is more difficult to treat because by then the disease will have spread to the pelvis and abdomen. Eventually they can develop chemotherapy-resistance. This year’s ASCO has produced a wealth of new cancer treatment possibilities that could very well pave the way toward a next generation of therapies that do not necessarily involve radiation, chemotherapies, and other current therapeutic options. For researchers, the new data gives them jumping-off points for new research projects. For cancer patents, the positive results are a welcome sign that doctors are getting closer to controlling and even curing cancer at its root.